ToyBoxTales.com » Blog Archive » Your Planet, Or Else! What does it profit a man to conquer the whole galaxy but loses his soul? That’s what Darth Nader learns when he tries to conquer the planets of Kermit, Jar Jar, and Buzz Lightyear. Darth Nader seemed victorious but he suddenly got a virus from a mosquito and drops dead. 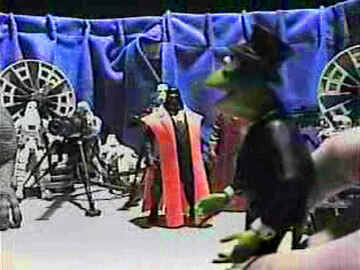 Kermit was surrounded by Darth Nader’s forces so he surrendered the planet to him. 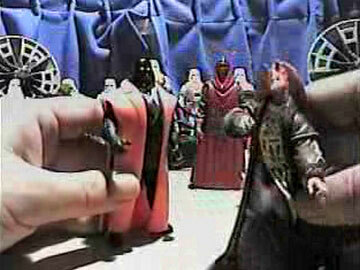 Same with Jar Jar who gave planet Naboo to Darth Nader’s power. 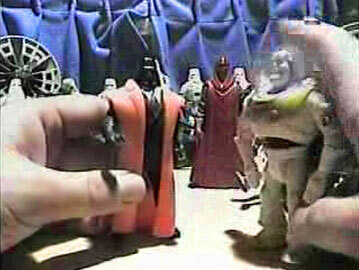 Buzz Lightyear tried to fight back but Darth Nader said he’ll Super Soak the whole planet if Buzz doesn’t surrender. 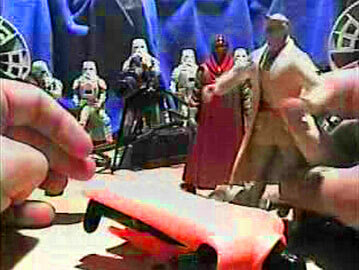 The little people had no choice but to surrender. All of a sudden, Darth Nader got a virus from a mosquito and dropped dead. A lesson was learned that it does not profit a man to conquer the whole galaxy if he loses his soul. This entry was posted on Sunday, October 20th, 2002 at 12:00 pm	and is filed under Buzz Lightyear, Darth Vader, Jar Jar, Kermit, Salvation, Season 1. You can follow any responses to this entry through the RSS 2.0 feed. You can leave a response, or trackback from your own site.